More than a month into the battle for Aleppo, the rebels who seized control of much of the city sense that its residents do not yet fully support them. Opposition fighters â€“ around 3,000 of them â€“ are almost the only people moving around the eastern half that the Free Syrian Army now controls. The small numbers of non-fighters who remain seem to pay them little heed. Few seem openly welcoming. Another old man walked slowly up the hill and across an intersection towards one of two impromptu rebel outposts. A helicopter hovered menacingly above and chunks of masonry from a nearby explosion made his going difficult. “Where are you going, Haj [respected elder],” one rebel asked him. “I want to go to the mosque,” he replied. The old man wandered slowly back down the road, oblivious as mayhem erupted around him. A unit had seen a helicopter approaching from the east and had opened fire with another machine gun. The helicopter flew away unharmed, just like the jet minutes earlier. “We really need someone who can shoot these things,” said a rebel commander, Jaafar Furad. Winning the skirmishes overhead could prove decisive in the battle for Aleppo. For now though, the outgunned rebels in the city’s south-west are trying to claw back gains on another front. The suburb of Salahedin, their stronghold until air strikes forced them to withdraw, remains the most bitterly contested corner of the Syrian uprising. Early on Monday a Japanese reporter, Mika Yamamoto, 45, from the Japan Press news agency, was killed during a clash in the area between regime gunmen and the rebel group she was with. 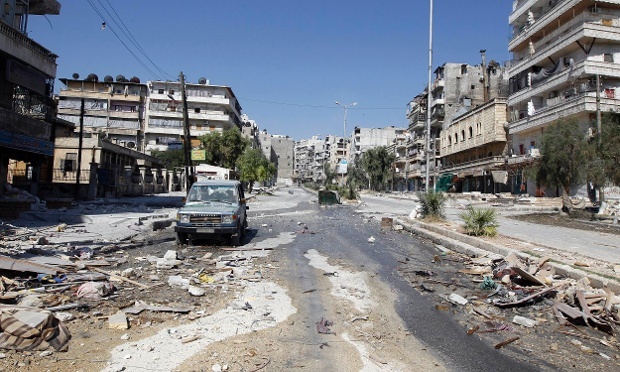 Regime forces have entered the neighbourhood and are probing into adjoining districts. The street fighting is intense, sometimes room to room, the two sides separated only by walls. “We can hear them and sometimes we insult each other,” said Mohammed Jou, a carpenter turned rebel from the Aleppo countryside. Syrian rebels are not alone in using these routes to the frontline. In recent days another group of fighters has arrived, jihadists from other parts of the Islamic world. The Guardian saw four such fighters â€“ a Saudi, a Pakistani, an Algerian and a Senegalese man â€“ waiting at a staging point not far from Saif al-Dowli on Monday. Others, perhaps as many as 30, have entered Salahedin. “Are you a Muslim?” the Senegalese fighter asked in response to a greeting.